A Gordon Highlanders Homecoming parade in Huntly. Towards the end of the conflict the 5th Battalion liberated Chievres, close to the French border, and a week later returned to present their regimental flag to its mayor. In return they were given a key to the town, which has remained on display at the Gordon Highlanders Museum in Aberdeen to this day. Exactly 100 years on, 70 members of the Gordon Highlanders Regimental Association (GHRA) have been invited back to the town for another flag ceremony. 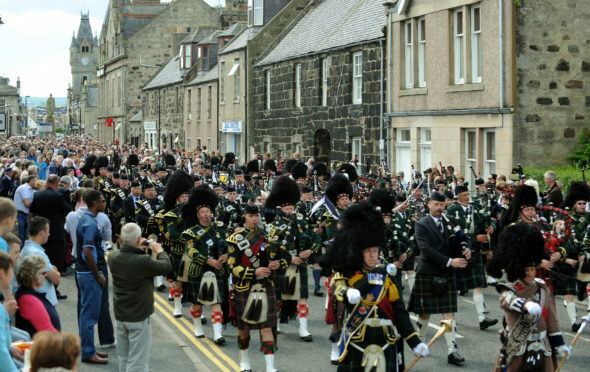 They will be joined by the Aberdeen University Officer Training Corps Drums and Pipes. GHRA regimental secretary, Grenville Irvine-Fortescue, said: “A blessing and unveiling of two stones, either side of the city’s war memorial, will take place commemorating The Gordon Highlanders and to mark the occasion.